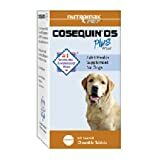 Cosequin is a patented, scientifically researched nutritional supplement dispensed by thousands of veterinarians to help dogs maintain healthy joints. Recommendation as a Supplement: The initial administration period is 4 to 6 weeks. Most animals should respond within this period. Improvement on Cosequin can range from gradual to dramatic. If the improvement is gradual, it may go unnoticed by the owner. 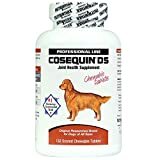 It is therefore important to keep the animal at the initial amount for at least 4 to 6 weeks before deciding to discontinue the use of Cosequin. If there is gradual improvement and Cosequin is discontinued, a regression of clinical status can occur. Tablets can be directly fed to pet or crumbled and mixed with food.